They were stars as children and then made it to the Big Time. 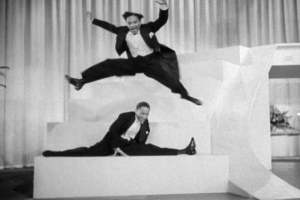 We are talking about the Nicholas Brothers, the most amazingly athletic dancing act to grace a series of classic movies, tv programs and shorts. The duo — Fayard (1914 to 2006) and his younger brother Harold (1921 to 2000) — had long lives and long careers. The product of a middle class musician/vaudevillian family, they cut their collective feet early on observing legendary performers (eg. tapper Bill Robinson) in action. Neither had any formal training. By the mid 1930’s the Nicholas freres had logged successful dancing stints on the radio, stage and night clubs (notably the Cotton Club, accompanied by the big bands of Duke Ellington and Cab Calloway). Impressed, producer Sam Goldwyn took the duo to Hollywood for a specialty number in 1934’s Kid Millions, their movie debut. The Nicholases usually didn’t get prime billing but by the early Forties their electric dance routines — which juiced the dullest of studio musicals — could not longer be ignored. See the bill below. The duo worked in Hollywood and made personal appearances all over the world. One of their legacies is a batch of entertaining movies and shorts as well as a host of awards from international arts organizations, celebrating their inimitable dancing style. 1) Question: The Nicholas Brothers’ routine in the finale of 1943’s Stormy Weather, with the duo dancing on top of a piano, was dubbed by which one of the following as the “greatest movie musical sequence” he had ever seen? a) Sam Goldwyn; b) Dan Dailey; c) Bobby Van; or d) Fred Astaire. 2) Question: What describes what has become known as the dancing style of The Nicholas Brothers? a) Break Dancing; b) Jazz ballet; c) Tiptap dancing; or d) Flash Dancing. 3) Question: There is no question that The Nicholas Brothers became international stars. Which of the following did NOT happen during their lengthy career? a) A royal command performance in 1948 for King George VI; b) A retrospective of their movie appearances at the 1981 Academy Awards; c) Dancing for nine different U.S. presidents; or d) Having their movies included in the National Film Registry. 4) Question: In another stylistic signature move, the duo would a) levitate across the stage; b) leap together 10 feet into their air; c) rise from splits without the use of their hands; or d) all of the above. 5) Question: The Nicholas duo would most often be confined to “specialty numbers” in movies. Any idea why? 3) The usual ‘trick’ question from the ‘guys’ -NONE as ALL the options happened. 5) Probably because they were BLACK… And also, they could easily outshine the white stars being so popular with all audiences. Just as a suggestion, and a gauge of readership… Maybe Joe & Frank should ask their readers what topics, movies, genres they are interested in, and what would it take to get them to COMMENT?